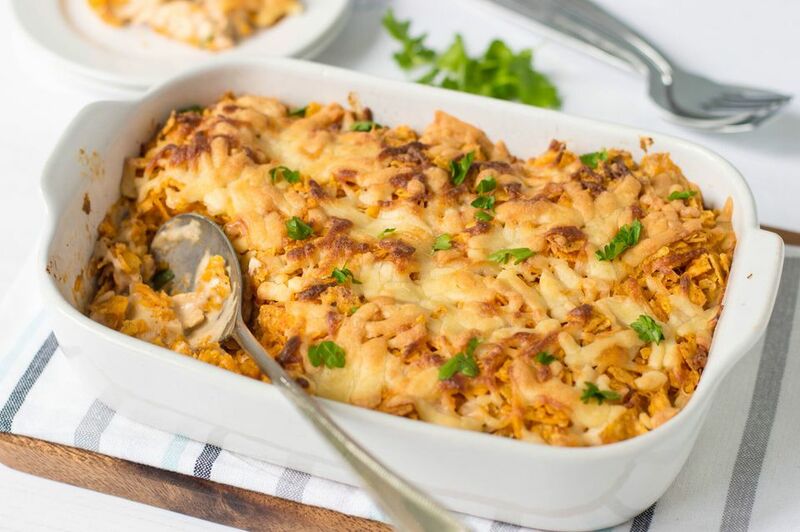 This Dorito chicken casserole is a simple and flavorful meal with a crunchy cheese and Dorito chip topping and crust. This is a casserole the whole family will love! This tasty chicken casserole was shared on our forum by Miz Suzi. The filling for the casserole is made with cooked diced chicken, sour cream, and condensed soup. A combination of mozzarella and cheddar cheeses are added before it's baked. When it comes to Doritos—or similar corn chips—there are many flavors to choose from, including ranch flavored and spicy nacho cheese. Choose your family's favorite flavor, and feel free to use a cheese blend instead of the mozzarella and cheddar cheeses. See more add-in suggestions in the tips and variations below the recipe. Heat the oven to 350 F (180 C/Gas 4). Grease a 2-quart casserole dish or spray it with nonstick cooking spray. Cover bottom of casserole with half of the crushed Doritos, about 2 cups. In a large bowl combine the diced chicken, sour cream, condensed soup, onion, chili powder, salt, pepper, and garlic powder. Pour the chicken mixture on top of the crushed Doritos in the casserole. Sprinkle the remaining crushed Doritos over the chicken mixture and then top with the shredded mozzarella and cheddar cheeses. Bake the casserole in the preheated oven for 30 to 40 minutes, or until the topping is melted and lightly browned. Add a can of diced mild green chile peppers or a finely chopped jalapeno pepper to the chicken filling mixture. Replace the cheddar and mozzarella cheeses with a Mexican blend or taco seasoned shredded cheese. Make the casserole with leftover turkey instead of chicken. Add a few tablespoons of crumbled bacon to the chicken and sour cream mixture. Add 2 to 3 tablespoons of finely chopped green or red bell pepper to the filling mixture. Top the filling with a small can of drained sliced ripe olives before adding the crushed Dorito topping.